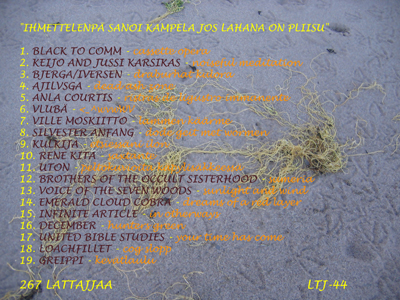 LTJ-44 "Ihmettelenpä Sanoi Kampela Jos Lahana On Pliisu"
New compilation of the psychedelic underground, released 26.7.2006, features an insert. Limited edition of 100 copies on black CDRs. NOTE: digital version released 28.8.2013, you can find it from this link.